Geneva, Switzerland, 27th September 2018- UICC, as part of the International Cancer Control Partnership (ICCP), has conducted a global analysis of national cancer control plans (NCCPs). In collaboration with the World Health Organisation (WHO) and ICCP, UICC has coordinated a global review of national cancer control plans. Over a period of six months a truly international group of 67 expert reviewers based in 16 different countries reviewed over 500 documents from 158 countries. 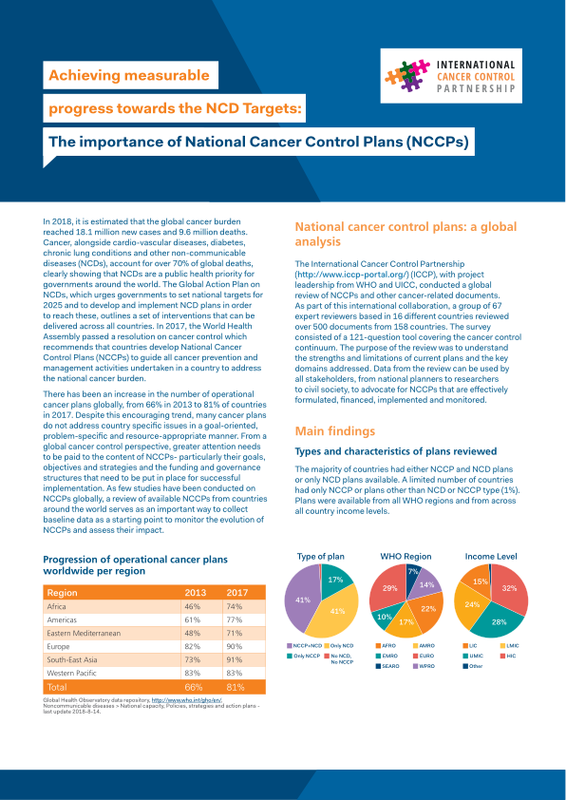 The analysis showed the importance of NCCPs in providing strategic direction to national cancer control plans and to reducing the cancer burden. The findings have been published today in the Lancet Oncology, ahead of the World Cancer Congress. To access a summary of the findings and policy recommendations based on the analysis click here. The importance of developing and implementing national cancer control plans has been underlined over the past decade as key steps to translate commitments related to non-communicable diseases (NCDs) into action. The Global Action Plan on NCDs urges governments to set national targets for 2025 and to develop country-level NCD plans in order to reach these. It outlines a set of interventions that can be implemented across all countries and includes actions specific to cancer and other NCDs. In 2017, the World Health Assembly passed an updated resolution on cancer control which recommends that governments develop NCCPs to guide all cancer prevention and management activities undertaken in a country to address the national cancer burden. Since 2000, there has been an increase in the number of cancer plans globally, from 49% of countries to 87% of countries in 2015. Despite this encouraging trend, many cancer plans do not address country specific issues in a goal- oriented, problem specific and resource appropriate manner. “We are very excited to provide the first global review of cancer-related national health plans which serves as a starting point to monitor the evolution of NCCPs globally and assess their impact. We have seen a significant increase in the number of national cancer control plans over the past 15 years, now we need to see an improvement in their content mainly in their objectives, strategies and the funding and governance structures that need to be put in place for implementation”, said Cary Adams, Chief Executive Officer of the Union for International Cancer Control (UICC). The review utilized a questionnaire developed by WHO of 121 items encompassing the entire cancer control continuum from prevention, early detection and diagnosis, treatment, survivorship to palliative care, research, health workforce, health information systems, governance and budget. The study team examined plans in terms of coherency, consistency and comprehensiveness which helped to generate a snapshot of the national cancer control planning in all WHO regions and World Bank income groupings . This detailed study improves the understanding of strengths and limitations of current plans. Additionally, data from the review can be used by all stakeholders, from national planners to researchers to civil society, including UICC members, to ensure plans are effectively formulated, financed, implemented and monitored. The questionnaire addressed 11 distinct domains across the cancer control continuum framed through a health systems approach. Greater attention was placed on prevention and early detection compared to cancer treatment and care. Overall, countries had strong inclusion of early detection in their plans with greater emphasis on cancer screening than other interventions promoting early diagnosis. The delivery of cancer services and the health workforce were poorly addressed across the plans. Data from this study have confirmed recent improvements in the comprehensiveness of cancer plans. These improvements might be related to technical engagement from local, national, or international partners, emergence of evidence-based policy guidelines, or increased awareness of the importance of NCCPs. However, the authors found that national plans had insufficient detail to operationalise plans and limited evidence of effective implementation. “Effective cancer control planning will guide countries toward improving outcomes and achieving universal health coverage by setting a roadmap and making the right investments. This planning must be linked to evidence of successful implementation. While this work shows that there is still room for growth and improvement, progress is being made, and tools are emerging to support governments provide cancer care for all.”, concluded Dr André Ilbawi, corresponding author of the study, World Health Organisation. As countries move towards universal health coverage (UHC), greater emphasis is needed on developing NCCPs that are evidence-based, financed and implemented, ensuring translation into action. One key element for measuring the impact of an NCCP on the national cancer burden is setting up a framework for Monitoring and Evaluation. The study found limited reference to monitoring and evaluation mechanisms in cancer-related plans, particularly in LMICs. The ICCP partner organisations and UICC members can use the findings of this study as a baseline and monitor priority areas for attention in the planning and implementation cycles of national cancer control programmes.